Hasma (Xŭe Há 雪蛤) is the fatty tissue surrounding the fallopian tubes of the Asiatic grass frog. It is dried for transport and sale, then reconstituted for use in desserts by boiling in water with rock sugar. In its dried state, hasma is whitish in color, which may, along with the fact that it is harvested in China’s frigid far northeast, be the source of its Chinese name (lit. ‘snow clam’). 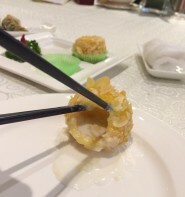 When reconstituted, hasma is light, chewy, and glutinous; in sweet dessert soups, it is paired with longan, red dates, and lotus seeds, among other delicacies. “Three snow soup” combines hasma with Asian pear (or snow pear) and snow fungus. On the dim sum menu, small pieces of hasma can be found suspended in the creamy, vanilla-tinged filling of the Hasma Puff pastry.. In all cases, the hasma itself carries little taste, its faint, savory marine flavor usually disappearing into the dish. Hasma is appreciated instead for its texture—pleasingly glutinous, with a tapioca bounce—and its thickening qualities, which help bring a rich, silky mouth-feel to the dessert soups in which it most often appears. But the real key to hasma’s appeal may be the simple fact that is an exotic ingredient from a remote location, which many diners believe will bring them health benefits. The two qualities are often conflated; rarity equals efficacy. Chinese cuisine is full of unusual ingredients like this, consumed in large part because they are believed to slow aging, restore health, and avoid disease. In the case of hasma, it is cited as a respiratory tonic, but this has not been supported by research. More predictably, hasma is also claimed to improve female fertility, since it is tissue from the frog’s reproductive system, and in addition, to benefit the complexion, probably due to its elastic texture. Similar claims are made for pigs’ feet, on account of their collagen; China’s medicinal foodways often dictate that one should eat from the animal exactly what one wishes to strengthen in oneself. Medicinal qualities aside, hasma does add a satisfying note of luxury to dishes in which it appears, since it comes from so far away, and so much labor is required to bring it to the table. Dried hasma can be found for sale in Asian markets under the English name “Snow Jelly”.